This is a great recipe for using up almond meal leftover from making almond milk. If you are using dry almond meal, ignore step 1 and 2 in the method. 6 medjool dates, finely chopped. 1. If you have wet almond meal leftover from making almond milk, you will need to dry it out. Spread leftover almond meal on a baking tray (roughly 1/2 cm thick) and place in a pre-heated, fan force oven at 180C. 2. Bake for 20-30 minutes, or until most of the moisture has evaporated from the almond meal (test this by running it through your hands after it has cooled slightly). 3. 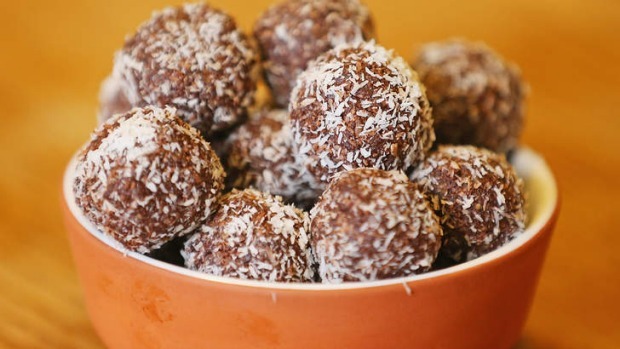 In a food processor, combine all the ingredients for the choc almond balls, to form a smooth paste. 4. Roll into balls using your hands, then cover with a layer of desiccated coconut. Serve straight away, or refrigerate for later.